We traveled in Santorini via a cruise ship for our honeymoon end of August 2018. We had a private tour with Markos who was amazing. He was incredibly knowledgable, very energetic, and kept us laughing with good conversation the entire time. He even helped us get a reservation with a great view for dinner. We got to see Oia, a black beach, went up to one of the highest points in Santorini for great pictures. He was even going to take us to a winery, but I was too concerned to get back to the ship in time I'm sure it would've been fun. The van he drove was impeccable, very clean. 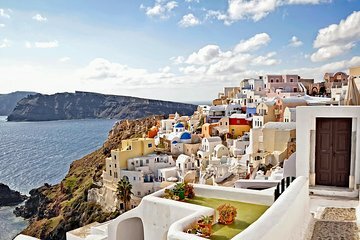 If we're ever back in Santorini we'd definitely book this type of tour again! Our guide was knowledgable, but spent a lot of time talking about himself. Feel we didn't see everything that was planned. This tour was absolutely amazing. Our guide Kathrin was beautiful and kind. Very knowledgable and lots of fun. Mum and I both have mobility issues and Katherin made sure we were looked after at all times and that we did everything we wanted to at our own pace. We were late getting into the cruise port, but this was not an issue, as Kathrin was waiting for us and managed to make up time quickly so that we didn't miss out on anything we had planned. We were comfortable and felt welcome at all times and even managed to get some great photos as Kathrin offered to be our personal photographer. At our request, she joined us for lunch and helped us pick out some local cuisine and continued to provide detailed information about the produce of the area and the local customs. It was my birthday and Kathrin also ensured that it was extra special with a generous little surprise! Honestly, we can not recommend this tour enough and are just so happy that we booked this one over all of the others out there. If you have mobility issues, then consider these guys, as they really know how to look after you. Love our personal tour guide. He showed us places of Santorini that we would not have seen outside of a personal guide. His knowledge was most excellent of the sites he drove us too. Would totally recommend this tour. My family and I had a private tour in Santorini. We were in a cruise ship and we got delayed because the ship cannot dock on the pier and we have to be tendered. We have to wait in line to be transported to the island and again a very long line in getting a ticket to the tram to transport us to (Thira) the main town, Marcos our tour guide was patiently waiting when we arrived. He took us to his van and had a 30 min ride to Oia and was excellent in giving us the history, the main tourist spots, the state of the economy of Santorini and Greece in general and some interesting facts. he made our 30 min round trip ride very interesting. I like his passion and love of what he is doing. You will not get bored with this guy! Our guide Marcus was great. He was very engaging. He asked us about what we want to see and also provided us with recommendations/insider tips about the island. We go to Santorini with Celebrity Reflection beginning of May. This is a very good season to visit. We're a party of 6 and we have our own van. The guide is Arsenios and he's great! He is very knowledgeable of everywhere we go and every question we ask he has an answer for it. He is very helpful and flexible. Since we are a private group, he doesn't mind going all over the island even it's not mentioned in our tour description. He loves his island and wants to share everything he knows about it with us. We like his attitude and I think he takes us around and we must have been to almost the whole Santorini, from North to South, East to West. We really enjoy the tour and we thank Arsenios for what he has done extra for us! Marco was great and very accommodating. This was an amazing tour! Highly recommended! Let me start by saying I'd give this 10 stars if that were an option! Just an overall fantastic and special day! My husband and I are quickly becoming the two best promoters of Viator.com! 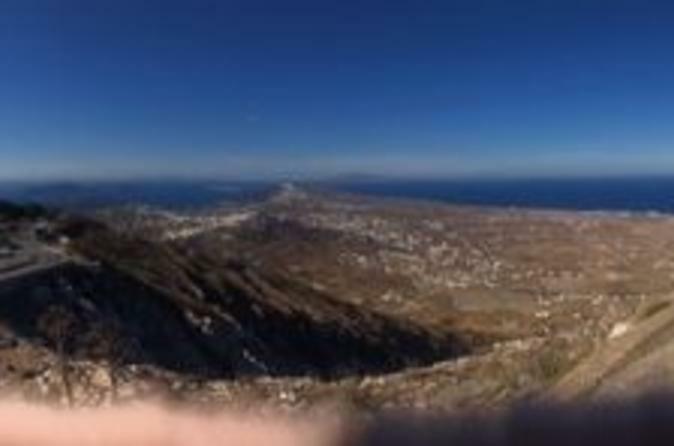 Arsenios greeted us at the top of the cable cars, those views! Santorini is a tender port and we were late by 20 minutes, due to the folks with ship arranged shore excursions departing first. The independents and there were lots of us, left right after. So, Arsenios wasn't concerned at all, greeted us with a big smile and quickly set about finding out what he could do to customize our time in Santorini. He listened to our needs, our limitations, etc and quickly came up with a plan. We were in a very comfortable van with a very good and careful driver so felt very secure and comfortable. Mostly, we felt lucky to have been paired with Arsenios as he is an incredibly knowledgeable person and also very charming. We saw the entire island, from end to end. He brought us to his favourite bakery and ordered snacks for us everyone spoke Greek so this was helpful!. Although he declined our offer to buy him something there, you could tell he was happy to be asked. He is very gracious and appreciative. He welcomed our many questions, patiently answering them all! This was the most amazingly special island. We learned so much from Arsenios that we just want to come back and stay for a nice visit and discover even more! Thank you Arsenios! You gave us a great experience, designed just for us! We are so very appreciative! We can't recommend this tour enough! You will not be disappointed, rather you will be thrilled you did!